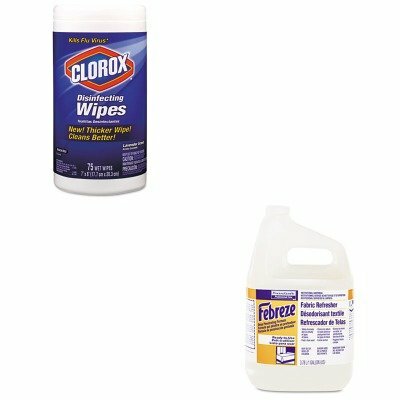 KITCOX01761EAPAG33032CT - Value Kit - Febreze Fabric Refresher amp;amp; Odor Eliminator (PAG33032CT) and Clorox Disinfecting Wipes (COX01761EA) by Febreze at Blog Free Here. MPN: COX01761EAPAG33032CT. Hurry! Limited time offer. Offer valid only while supplies last. lt;stronggt;PAG33032CTlt;/stronggt;lt;BR/gt;Febreze Fabric Refresher amp;amp; Odor Eliminatorlt;BR/gt;Cleans tough odors, doesn't cover them up. lt;stronggt;PAG33032CTlt;/stronggt;lt;BR/gt;Febreze Fabric Refresher amp;amp; Odor Eliminatorlt;BR/gt;Cleans tough odors, doesn't cover them up. Apply directly on fabric once fabric dries, smell is gone for good. Eliminates food and smoke odors on virtually all fabrics. Scent: Fresh Clean Physical Form: Liquid Application: Fabric.lt;BR/gt;lt;BR/gt;lt;stronggt;COX01761EAlt;/stronggt;lt;BR/gt;Febreze Fabric Refresher amp;amp; Odor Eliminatorlt;BR/gt;One of America's favorite disinfecting wipeskills 99.9% of common illness-causing germs, including Staphylococcus aureus staph, Salmonella enterica, Escherichia coli E. coli and viruses that can cause colds and flu. Ready-to-use premoistened wipes clean and disinfect. Just wipe, toss and you're done. One towel goes a long way. Bleach-free. Towel/Wipe Type: Cleaner/Detergent Wet Wipe Application: Bathrooms Gyms Hospitals Kitchens Offices Schools Applicable Material: Acrylic Ceramic Chrome Fiberglass Glass Metal Plastic Tile Vinyl Wood Materials: Non-Woven Fiber.